Cal State LA’s Special Collections and Archives student assistant program seeks to provide an opportunity for Cal State LA students who are interested in the library science, archival and museum field. Student assistants are paired with collections and projects that relate to their area of interest and field of study. Working closely with the University Library Archivist, you will have to opportunity to build a program that works for your academic needs and interests. As a student assistant you are fully integrated into the management and operations of the unit by attending staff meetings and contributing to decisions on polices and procedures. Student assistants also participate in public outreach by drafting blog and social media posts, and assisting with exhibits, tours, presentations, and events. Application Process: We are no longer accepting Student Assistant applications. Please check back with us toward the end of Spring Semester 2019. The Rare Book School (RBS). Interested in archival work, curatorship or special collections librarianship? Don't know where to start? Cal State LA Special Collections and Archives welcome you to apply to our volunteer program! Volunteers play an important role within Special Collections & Archives, contributing to the overall success of the department. Volunteers should have an interest in community and university archives; rare books; or archival management and rehousing. Volunteers should be able to spend at least four hours a week on assigned tasks. Opportunities are offered in the spring, summer, and fall semesters. Current volunteers interested in extending their appointment will need to reapply. We are no longer accepting volunteers for the spring 2019 term. Please check back with us in May for details about the summer 2019 application process. 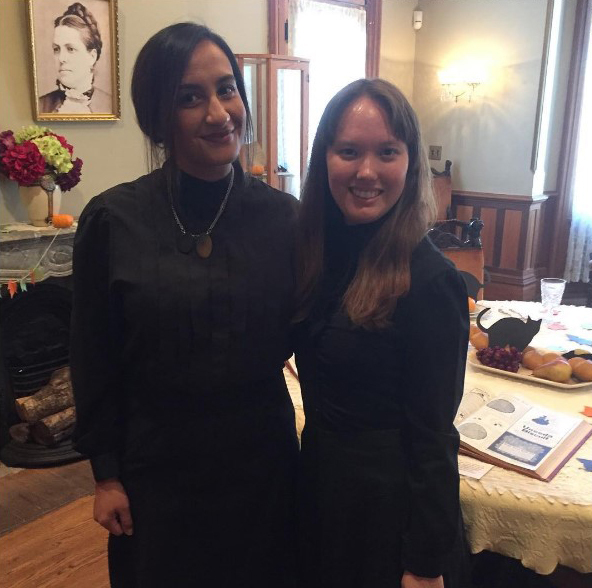 Former volunteer, Virginia Castañeda (Art History MA student) and former Archives Assistant, Allina Nunley (Adjunct English Instructor) participating at the Mourning Tours Event at the Heritage Square Museum. from Cal State LA's historical collections for a chance to win $500! 1. Be sure to RSVP for one of our workshops (open to graduate and undergraduate students). 2. Browse our manuscript collections and/or rare book collections to identify primary sources for your research. 3. Schedule a research appointment at Special Collections and Archives to view the materials. 5. Submit your completed application by Sunday, May 5, 2019 at 11:59pm. Early submissions will be accepted. 1. Submit the Online Application Form. 2. Email your essay (including reference pages) as a single PDF to specialcollections@calstatela.edu. Note: Electronic submissions only. No hard copies will be accepted. One participant will be awarded a $500 prize. The winner will be announced at a reception in the Special Collections and Archives Reading Room on Thursday, May 9, 2019 at 3:00pm. A committee of three interdisciplinary Cal State LA faculty members will evaluate and rank papers. Download the scoring rubric below.